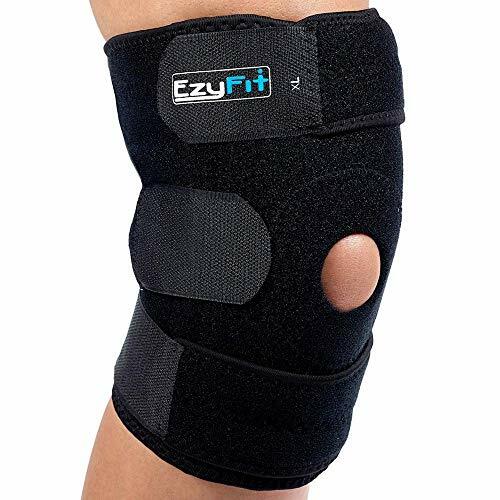 ​If you are in a hurry and just want to find out what the best plus size knee brace is, then we recommend BraceAbility 6XL Knee Brace as the best one. Anything that places a large amount of stress on the body’s joints will lead to problems. Whether it’s an acute injury, such as a torn ACL or something more chronic like osteoarthritis (osteoarthritis happens in 10% of men and 13% of women aged 60 years or older) the pain and decreased mobility can make it difficult to get around. In this article, we reviewed best knee braces for plus size that will help you return to physical activity. Why Can Being Overweight Lead to Knee Problems? Why Are Plus Size Knee Braces Good For Arthritis? Why are plus size knee braces good for overweight or obese people? How to select the correct size for a knee brace? Individuals who are overweight or obese often experience these types of issues associated with knee pain and degenerative knee conditions like osteoarthritis. Not only are the knee joints carrying more weight, but any potential pain or stiffness can make it difficult for anyone to get out and participate in a physically active lifestyle. Therefore, in this article, we would like to provide our information and reviews of the best oversized knee braces. The focus on plus size braces for knee pain will hopefully help larger individuals find something comfortable that fits properly, and just as importantly, something that can help with pain reduction, stability, and support, and ultimately a better chance at getting back to your daily activities. We should also note that these aren't necessarily restricted for people who are trying to make a lifestyle change but are good knee braces for big legs in general. We will get straight to the point and provide our favorite picks for the best knee braces for plus size below. Underneath the review section, you can find more general information about how body weight can affect knee health, and how knee braces generally assist with reducing knee injury and sometimes pain. The BraceAbility bariatric knee braces are one of the most popular lines of knee braces for plus size currently on the market. They are widely available and come in many different plus sizes including XL, 2XL, 3XL, 4XL, 5XL and even 6XL, allowing you to find the right fit for you. Sizing charts are available by following the link above, and these charts also include helpful pictures of where you should be taking the measurements on your leg. This is a neoprene knee brace with an open-patella design to allow for an anatomical fit. One subtle feature that can actually go a long way is the cutout behind the knee, which helps to prevent the brace from bunching up while you move around, reducing the chances of any excessive rubbing. The simple wrap-around design (read more about knee sleeve vs knee wrap here) closes at the front making it easy to put on and take off. The Velcro straps are strong and these are adjustable knee braces for large legs so you can further refine the fit after you select the size that works best for you. One really cool aspect of the BraceAbility bariatric hinged knee brace is the side hinges that provide exceptional stability. These hinges act to limit your range of motion in the side-to-side direction, which are bad movements for the knee joint. For example, these types of movements can cause tears to the LCL (lateral collateral ligament) and the MCL (medial collateral ligament - see our mcl knee brace suggestions here), which are the ligaments that run up the sides of your knee joints. If you’re doing some more research online, you may also see these types of movements described as varus or valgus forces. So what if you don’t need that additional support on the medial and lateral sides of your knee? This large knee brace is fairly unique in that you can actually remove the hinges, which effectively turns it into a nice lightweight sleeve that offers a little bit of support, but not as much as when the hinges are in. Overall, this is one of the more reliable options for a plus size knee support, and with many sizes to choose from you have a good chance of finding a size that works well for you. Just make sure to take the measurements of your leg and thigh very carefully before purchasing, otherwise you may find yourself having to exchange for a different size knee and thigh brace. The EzyFit XL knee brace is a less robust knee brace when compared to the BraceAbility bariatric knee brace. This isn’t to say it’s worse, but rather, the applications are slightly different. If you’re just looking for a little added support with a simple design, this could be a good option. One great thing about this large size knee brace is the price. It’s quite cheap, primarily due to the simple design, so it’s something that a lot of people can take advantage of. It also makes it a nice choice for someone who may not know how much they will actually wear a knee brace. The EzyFit doesn’t come in that many different sizes. In fact, it’s not truly a big knee brace, as they simply add in the XL size in addition to their typical medium and large. That being said, the x large knee support can accommodate individuals with a knee circumference of 16”-24”. In this case, it’s important to note that the manufacturer requires the measurement to be around your leg at the kneecap, rather than above or below. The open-patella design allows for a large range of movement while still providing little extra support. The neoprene is a stretchy material that is about 3.5mm thick, and it has non-slip silicone strips at the top and bottom of the brace to help keep it in place while you move around. The Ezy Fit XL Knee Brace is also quite convenient in that it can be worn on either the left or right knee, and it’s easy to wash and keep clean. It’s fairly durable, as they ensure to double stitch the seams, and the stretchy knee brace is quite resistant to tears. Overall, this is one of the best plus size knee braces that many larger individuals have benefited from. The main downside is that it doesn’t offer as much support as some other extra large size knee braces, for example those with side hinges, but if you don’t need that level of support, then this is a great value item that could go a long way. This is another BraceAbility knee support; however, unlike the bariatric knee brace we reviewed above, this one is a compression sleeve that offers little stability, but helps to compress the knee and provide a little added support. These types of compression sleeves are handy items to reduce chronic pain and swelling of the knees. Many people wear them throughout their daily activity, is they are basically as thin and lightweight as they come, so you can wear them under your normal pants. The compression and elastic knee support do offer a little bit of added strength, but it’s not going to limit your range of motion when your knee is subjected to excessive stress, so it’s not a good option for those rehabbing acute knee injuries like ligament tears. In the meantime, it's always a good idea to continuously finding ways to how to strengthen your knees. This knee compression sleeve comes in many different sizes, with a range from XL all the way to 6XL. When viewing the measurement chart, it’s important to note that Point A is measured 6 inches above the middle of your kneecap, and Point B is measured 6 inches below the kneecap. The material itself is neoprene, but it’s very thin and soft and is also a latex free knee brace. It can be worn on either knee, and it’s easy to put on, just like a sock. One of the less convenient aspects of this knee brace is that you can’t put it in the washer or dryer. Instead, you need to hand wash it in warm water with mild soap and let it air-dry. Overall, this is a great option for people with extra large legs who need something to add a little bit of comfort to their daily routine and eliminate some of the swellings that have developed from conditions like osteoarthritis. Just keep in mind that for more severe knee injuries like ligament tears, this won’t provide any sort of end limit to your range of motion, so be sure that you don’t require anything more substantial. These Smalets plus size knee compression sleeves are slightly different than other common knee compression sleeves in that they actually provide quite a bit of support. The neoprene is 7mm thick, which is definitely substantial, and they are very strong. These knee compression sleeves are marketed directly towards men, as the company claims that men have different lower body movements than women, and therefore they designed the stretch for men only. While men do often have different gait patterns than women, it’s a little hard to believe that no woman could benefit from this product. Nevertheless, it’s something to be aware of if you’re shopping around for you or someone you know. 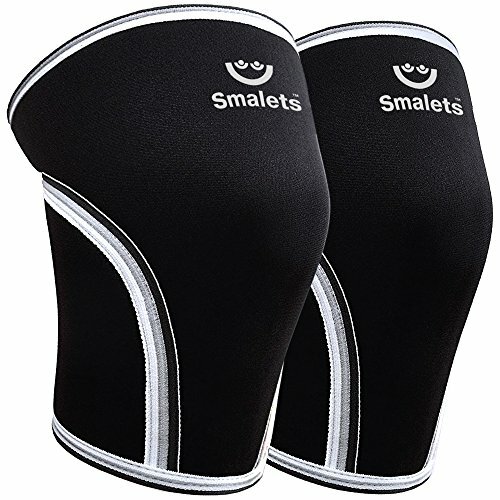 The Smalets knee compression sleeves provide substantial support by sleeve standards, but once again, without solid hinge systems and intelligently designed strapping, they don’t offer the level of stability that a more robust knee brace can offer. That being said, customers who have dealt with chronic pain and inflammation after knee surgery say these have ample support and immediately make their knees feel better due to the compression and thermal insulation. One thing worth noting is that while the company claims these are made of “breathable” neoprene, that’s really hard to believe considering the material is 7 inches thick. Numerous customers have supported this thought, saying that there is a lot of sweat present when they remove the sleeves. Some prefer this high level of thermal insulation, but it also means you will have to wash them more than other sleeves. Overall, these are excellent knee compression sleeves if you’re looking for the most support a sleeve can offer. They still don’t quite reach the level of a hinged knee brace in terms of stability, but there is definitely great value here for those who are looking to reduce knee pain and inflammation, particular men. 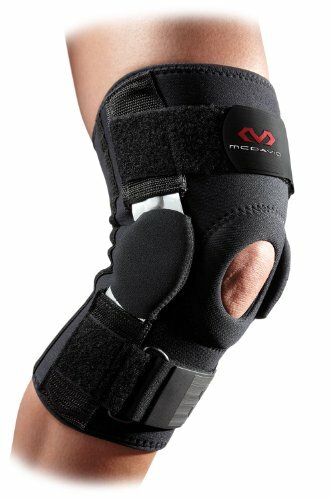 The McDavid 422 knee brace can fit either knee and has an extra long sleeve. The hinges at the knee provide superior support and protection. At only 2 lbs, this knee and leg braces won’t feel heavy and slow you down during activity. Due to the fact that this product isn’t too expensive compared to lots of other health products, most customers find it to be one of the best braces for your money, even though it's slightly more expensive in terms of leg and knee braces. 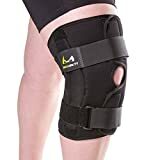 If you are looking for non-neoprene plus size knee braces, sturdy design of McDavid 422 means you’ll get extra support compared to a neoprene brace. The extra large knee support and the adjustability means that accurately sizing of this brace is important, but small adjustments can be made to optimize the fit with your knee. 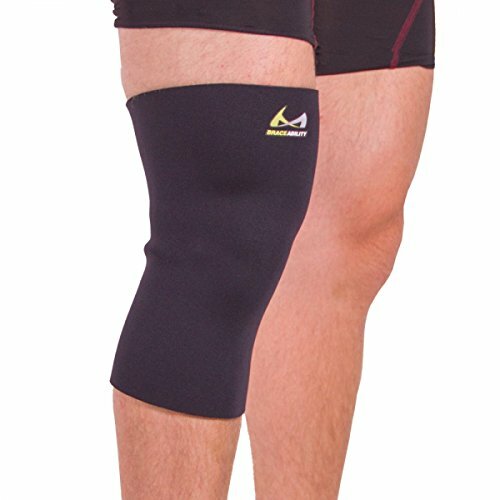 Many people consider this to be one of the classic go-to knee brace for basketball (a detailed breakdown of basketball knee injuries are here) and other sports, and while this is the case, it's still worth noting that McDavid does improve on existing braces with time, which continuously helps assure that you're getting one of the best knee braces. 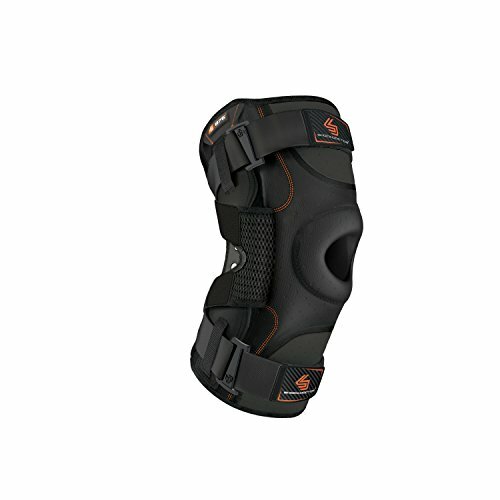 Additionally, even though McDavid is a highly popular brand among athletes, they do offer this 422 knee brace in XL and XXL sizes, so it is also available to some of the larger individuals out there. Examples of recent improvements with this model include wider hinge arms to aid in strength, but they still ​maintain the nice lightweight design. Also, the bound edges are a really practical feature, as they help prevent skin irritation, and combined with the perforated back panel, these features help increase your level of comfort while wearing the brace. Overall, this is an excellent value knee brace for basketball that is very well liked by numerous customers. It comes from a highly reliable brand, and its design promotes its all-around ability to stabilize and support the knee during rehab or on the court. The Shock Doctor 875 is one of the more robust knee braces for large knees. It's equipped with bilateral hinges and compression for maximum support. If you're looking for a heavy duty knee brace to help recover from an existing injury or during activity to ensure you don't re-injure an old injury this is a terrific option. The Shock Doctor 875 Knee Brace is a highly popular knee brace among athletes and the Regular Joe alike. It's available in many sizes, including XXXL, but XXXL is the largest size available. To ensure proper sizing, you're supposed to measure 2 inches below the knee, whereby size XXXL will accommodate a knee circumference (again, 2cm below the knee)of 16-17.5 inches (40.6-44.5cm). You can find the size chart here. This XXXL knee brace includes a neoprene sleeve, stretch mesh, aluminum hinges, and 4-way strap system to maximize stability. Although the Shock Doctor is a fairly heavy duty brace, the mesh system allows for comfortable heat ventilation while the vented neoprene provides good moisture-wicking ability. This is an advanced knee brace and can provide excellent support for moderate to major sprains and knee instability. This product is a bit snug at first but should break in with a few days of exercise. Customers who have used this product long-term are happy with the stability it provides without restricting the natural movement of the knee brace. Unlike many other designs, the Shock Doctor 875 XXXL knee brace will be more difficult to fit underpants, but it is still possible. When worn tightly, this brace can offer some compression, but not much more than a standard knee compression sleeve that you can get for much cheaper. This brace is better for more significant knee injuries or conditions that have resulted in a more unstable knee joint. Overall, this is an excellent XXXL knee brace and is comparable with the McDavid 422 knee brace that we reviewed in a separate article, although the Shock Doctor is usually available in larger sizes like XXXL. The main advantages in this Shock Doctor knee brace are in the strength of support and durability, which is known to be top-notch, but it comes at the cost of a slightly heavier and more rugged design. Depending on the nature of your injury, this could be great, or on the other hand it could be a little over-the-top, but in general, this is a great XXXL knee brace. 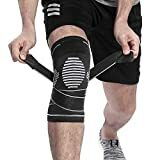 Shock doctor has listed a lot more information on their Amazon page with information specific to different knee injuries, so feel free to check that out as well! This is a great XXXL knee compression sleeve that is similar in function to the BraceAbility XXXL knee compression sleeve. One thing to note right away is that the XXXL size may run a bit smaller than its BraceAbility counterpart. For example, they say that for the Wuju XXXL knee compression sleeve, your upper knee circumference should be 15.4 inches, and your lower knee circumference should be 13.8 inches. Where exactly these measurements should be taken is unknown, but given the design of the brace, we would estimate 2-3 inches above and below. It seems that Wuju now only sells through Amazon, but you can still contact them through their website wujufitness.com. The Wuju Fitness knee compression sleeve provides excellent support by sleeve standards. It's a very tight fit with strong material that you will notice actually does help support your knee. Additionally, these types of braces are great for reducing chronic pain and inflammation from conditions like osteoarthritis, so they can be conveniently worn anytime - during activity, lounging around, and even sleeping. The sleeve will fit well under pants, but as a warning, it may take a little while to get used to the thermal insulation (heat) that it provides on your knee after a while. Other than the uncertainty surrounding the sizes, the only disadvantage to this knee compression sleeve is its tendency to slip down after a while if you are engaging in an activity like long walks or jogging. Some people, but not everyone, have found that under these conditions, they need to keep pulling it back up their leg as it gradually slides down. This issue is present in most knee compression sleeves to a certain extent, but nevertheless, it is something you should be aware of. Overall, Wuju Fitness XXXL knee compression sleeve is a great option for those looking to add little extra stability to their knee joint, while also reducing chronic pain and inflammation. It is highly convenient, as it can be worn anytime, and it is really easy to have on under pants. 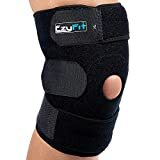 It's also very affordable, especially when compared to other knee braces, so even if you find you only use it around the house, it could still be a worthwhile investment depending on what you need it for (e.g. pain and inflammation). 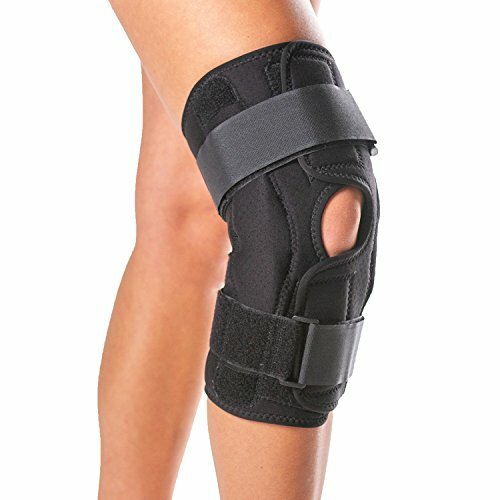 One of the most common plus size knee braces, available in sizes XL-6XL. Good all-around support and stability at a reasonable price. Great value overall. A really cheap oversized brace that performs above its price. Provides some support, but no hinges for lateral/medial stability. A compression sleeve better suited for chronic pain and swelling from conditions like osteoarthritis, but lacks stability for more severe injuries. Can be worn comfortably under pants for daily use. Similar to the BraceAbility knee compression sleeve, this is better for routine management of chronic knee pain and swelling. Provides a little support, and good for daily use. A more robust design that includes hinges for lateral/medial stability. Better than a sleeve for recovery from knee surgeries and ligament tears. Developed with typical male gait patterns in mind. Originally made for weightlifters. Great knee support for plus size design, and they come as a pair. Another extra large knee brace with side hinges for solid support, this one is available in sizes XL-5XL. Nothing fancy, but a sturdy design that offers good value. This is a knee compression sleeve that offers 4-way stretch and a gel pad that covers the kneecap. Available as an x large knee brace, it's good for osteoarthritis and kneecap conditions. Sizing runs a little small. Available in many sizes up to XXL, these are essentially the same as the Smalets knee compression sleeves mentioned above. 7mm thick, so great support by sleeve standards, but not the level of something with hinges. One of the most popular oversized knee braces on the market in general, McDavid is a great brand if you can find the right size. This one is a little more expensive, but you get what you pay for. Hinges for solid support and open-patella design for flexible movement. There are two very common ways that excess weight can lead to knee problems. The first is simply the act of mechanics, whereby the knees and other joints in the body will be subject to higher levels of stress. The second is something that has been proven a little more recently, which is an inflammatory response in the body. We will consider each of these in turn. One concept that very few people outside of physical therapy professions are aware of is that an increase in overall body weight will actually increase the stress in your knee joints by more than the gained weight. For example, current evidence suggests that for every extra pound of weight an individual puts on, their knees will experience 4 more pounds of added pressure (pressure is the same thing as stress from a mechanical perspective – Force per unit surface area). For those that have put on just a little bit of weight, let’s say over the holidays, this is why you may experience an increase in knee pain even without a very noticeable increase in overall weight. Many orthopedic braces are marketed towards athletes, and while they are certainly a population that often require these sorts of devices, the reality is that many more people in the general population benefit from sports medicine brace (check out our review of football knee braces for linemen here), especially those who are even a little recreationally active. There are a wide variety of types of arthritis and several models of plus size knee braces for arthritis. The one type of arthritis we tend to focus on is a condition called osteoarthritis, which is a degenerative joint condition that affects the body’s joints and is much more common in individuals who are classified as overweight or obese, and statistically, about 2/3 of Americans will fall into one of these categories at some point in their life. In this regard, being overweight is classified as a Body Mass Index (BMI) between 25-29.9, and obese is one step further with a BMI of 30+. Overweight or obese individuals are 4-5 times more likely to develop osteoarthritis, which can be quite debilitating. Given how common this condition is, there has been a lot of medical research in this area lately, as it affects virtually every aspect of our society (health care system, economics, but most importantly peoples’ personal health). Osteoarthritis is associated with increased pain and stiffness in the knee joints (most common), but it can also affect the hips (next most common), ankles, and other joints in the body. In a nutshell, osteoarthritis develops when the articular cartilage that lines the end of long bones (e.g. thigh and shin bones) breaks down. This cartilage that was once very effective at dispersing shock forces in the knees can become less and less effective as it gradually wears down. In severe cases, the cartilage will break down completely and will leave the individual with bone-on-bone contact, which can be excruciating and drastically reduce mobility. In one of our previous articles, we reviewed knee braces for osteoarthritis, so that could be a good resource as well, but this article included a wide variety of sizing options. In this current article, we will place our entire focus on knee braces for plus size, even in regards to osteoarthritis or obesity knee braces. More recent research has also found that excess fat in the body can lead to immune responses in addition to the more intuitive biomechanical effects. Inflammation can be local or systemic, but in either case is typically a negative response. Fat in general is being studied at an increasing rate due to its involvement in chemical processes, with some researchers even considering fat as an organ! It has been suggested, and highly agreed upon, that fat can create and release many different chemicals throughout the body, and these chemicals can often be pro-inflammatory. Inflammation is usually associated with pain, for example, inflammation from being sick can cause nasty headaches, and inflammation associated with the flu can cause some body aches. In the case of overall body fat, it does seem to act on the joints specifically, and while there is still a lot to be sorted out, it is generally accepted that excess fat mass can lead to an increased incidence of osteoarthritis via different pathways, both mechanical and physiological. Interestingly, a recent study indicated that subcutaneous fat in the thigh could have similar effects to abdominal fat (you'll be quite surprised to learn how many people search for knee braces for large thighs), which was a little unusual given there is much less fat in the thigh. Check it out for yourself! One of the best ways to prevent and treat joint pain and stiffness is to keep moving. However, this is certainly easier said than done if you’re already experiencing knee pain. Therefore, it is often suggested to act on these conditions quickly, as the more knee pain and stiffness you experience, the less likely you are to get out and use your knees. This dilemma creates a snowball effect, whereby pain and stiffness can keep piling up on your knees, and the more it does, the less likely you may be to engage in physical activity. Not absolutely everyone needs a knee brace, and this also goes for overweight and obese people alike; however, there are many benefits that could help a lot of people using an obesity knee pain brace. The first benefit of bariatric knee braces is that many of them can immediately reduce joint pain by applying compression to the affected area. While this won’t necessarily treat any current knee condition, it may simply help with making you feel better and potentially allow you to feel more up to engaging in some activity. The second benefit is that plus size knee support can help overweight people decrease their risk of knee injury due to excess motion. In people of any size, the main way to sustain an acute knee injury is by putting the knee joint into a position it normally doesn’t go into. You may have heard of ligament tears, for example a torn ACL, which involves damaging the structures that help connect your bones, ultimately keeping your joints stable. Damage to these structures usually occurs when a movement happens that they usually restrict, and they simply aren’t strong enough to stay intact. A knee brace for larger legs can help by offering extra support to the knee, effectively adding strength and stability to the knee joint, which can reduce the risk of injury. Even more subtle joint movements that don’t result in immediate injury can have a negative effect over a long period of time. For example, anterior knee pain is very common in athletes and the general population alike, and can be a result of repeated stress being focused on the front of the knee. Lastly, some knee compression sleeves (or plus size knee sleeves) can offer thermal support by insulating the body’s heat in an effective manner. If you have found that applying heat to the affected area can help make your knees feel better, then these types of knee braces can be a good option for everyday use, adding a bit of extra support, compression and heat, while you go about your daily activities. At the end of the day, a knee brace won’t cure all of your ailments, but they are certainly useful tools to help mitigate the effects and get you on your way to feeling better. Different knee braces have different purposes, so it’s always a good idea to visit a doctor or physiotherapist first to learn the exact extent of your knee condition. This can also help you when selecting the best big or tall knee brace for your needs. Whenever you're researching a knee brace, no matter what size, it's always a good idea to look at the associated sizing chart first. Most will require a measurement around either the thigh, mid-kneecap, just below the knee, or a combination. By being careful with the measurements and keeping an eye out for discrepancies between knee braces, you will maximize your chances of finding the best XXXL knee brace for your particular needs. Selecting a proper XXXL knee brace is no different than selecting a knee brace of any other size. The main factor in determining your decision will be the nature of your injury or condition of your knees. You can think about this in two main categories: Is it an acute injury that has caused your knee to lose stability, or is it a more chronic condition like osteoarthritis that has led to constant pain and inflammation in your knees? Acute injuries like a torn ligament or torn meniscus often result in a more unstable knee joint, especially while the knee is still healing. Unlike many other joints in the body, the bones that make up the knee joint don't lock in nicely like a puzzle piece. Instead, the knee relies heavily on surrounding structures to provide sufficient stability, such as muscles, ligaments, and the meniscus (the meniscus is a figure-8 loop of cartilage that helps absorb shock forces and improve the congruity of the knee joint). If you lose any of these stabilizing structures, especially a ligament, then you will likely require a brace that helps compensate for that loss. In this case, you will need something that restricts your range of motion or provides strict end-limits to your range of motion. Hinged knee braces are great for this, as they stop your knee joint from moving into unwanted side-to-side positions, and they usually prevent hyperextension as well. If you don't have an acute knee injury like this, but instead have more ongoing problems that are causing pain and swelling in your knee, then you may benefit from something more simple, and therefore cheaper as well. This is usually something like a compression sleeve, whereby the compression helps alleviate the pain and swelling from everyday activities. These can usually be worn comfortably under pants, and are great for daily use. Consulting with your doctor or physiotherapist will help shed some light on your particular injury or condition, which should help narrow your selection, making a choice easier. While activity is certainly one of the most recommended treatments for knee pain, it can be difficult to navigate and often requires additional treatments as well. One of the most effective methods to hone in on what type of activity could be good for you is to visit a physiotherapist. They can prescribe practical exercises that are catered to the individual and severity of knee condition. Even if you don't struggle with health problems, but are a large muscular person, knowing how to limit the negative longterm side effects of weightlifting, or how knee braces for large legs can help in general, is often best explained in person by a health professional such as a physiotherapist. I can say from personal experience that I have had great success with prescribed exercises for knee and back pain. They may be repetitive and boring, which can make it difficult to motivate yourself to do them at home, but if you stick with them, you will definitely see some good results. Anti-inflammatories can also help, especially just before or after activity when your knee may be responding and healing. As you may have guessed, anti-inflammatories help reduce the inflammation in your body, which can therefore decrease pain and stiffness. Advil and Ibuprofen are probably the most common anti-inflammatories on the market that are available over the counter. Just keep in mind these can be really hard on your stomach and liver, so definitely follow the recommended guidelines for consumption. Lastly, surgery and/or prescription medications could be necessary if you have an advanced form of knee osteoarthritis or other injuries or conditions. However, it is typically advised that these measures be avoided if possible. Surgery isn’t something that many people enjoy and the rehabilitation can pose another obstacle, and prescription medications can have side effects, interactions with other drugs, and may be costly. 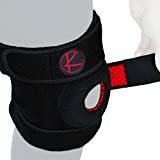 At the end of the day, if you are looking around for best knee braces for plus size, chances are you’re already taking a step in the right direction towards healing and becoming healthier overall. Knee braces can be extremely helpful for anyone, but especially those who are overweight or obese. 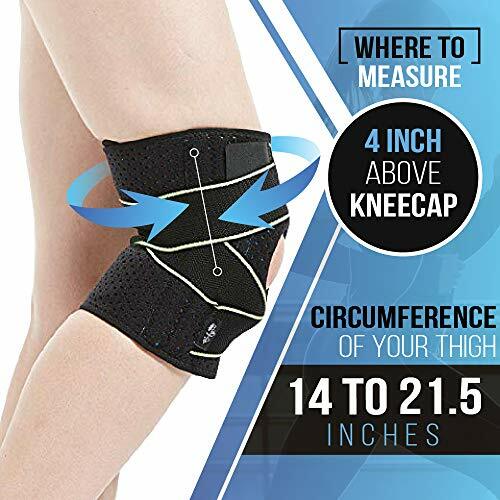 Keep in mind they won’t be a miracle cure, but in addition to providing some relief on their own, they are highly beneficial to help maintain some sort of physical activity, which can really go a long way in making your knees feel better again by figuring out how to size a knee brace. Good luck!